The Great Coat And Tie Experiment: Finally a Friday! Heckuva a thing to say after a four day week following a week of vacation but, really, I think I needed a vacation from my vacation. As a result, today's conglomeration is pretty straightforward too. So what else would I do but conglomerate around the navy sportcoat? If it's the navy sportcoat and a non-thinking conglomeration then it must be a blue dress shirt. 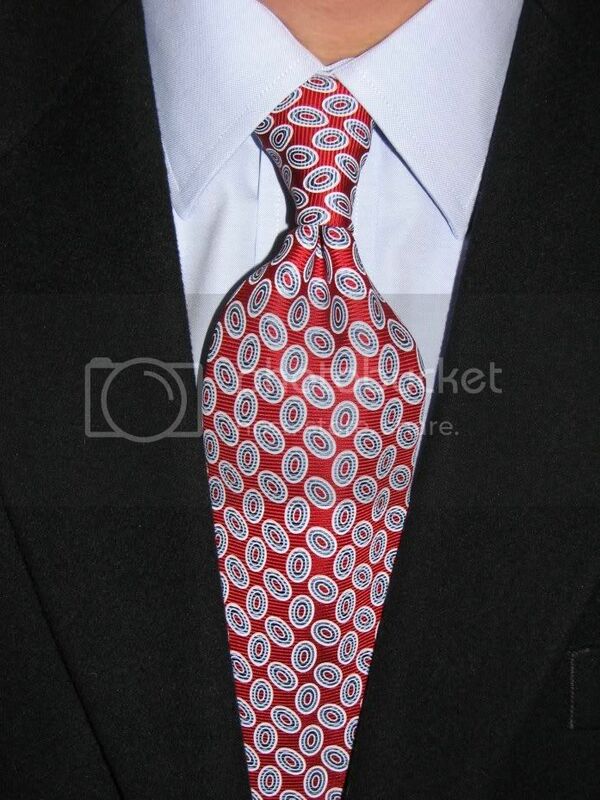 To necktie it all together I selected a red tie. It's got some nifty shades of blue ovals to, you know, take a bit from the shirt and sportcoat. It's a Paul Fredrick that looked really good in the catalog but never quite that good in person. It does make a pretty good knot though so it's not all bad. And with that I'll bid a fond adieu until next week -- Sunday. Hope everyone has a great weekend.